Isn’t the above image beautiful! This past week my wonderful wife, Mrs. Greenbean, completed a canvas for a friend of ours. It is a piece she color coordinated for the bedroom of a little girl, specifically designed to match a quilt. 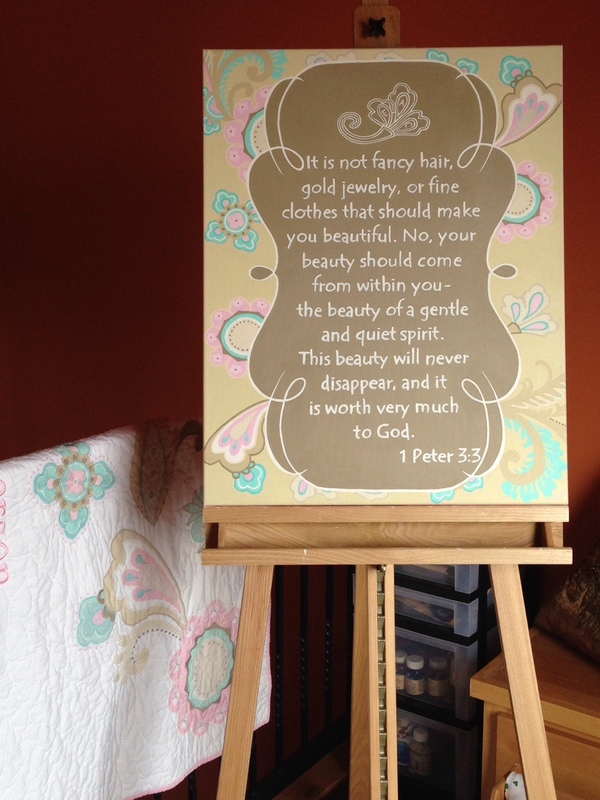 The piece is essentially just lettering of a Bible verse surrounded by color themes. I really like it. We hope the family it is for likes it too. By the way, if you’re interested, Mrs. Greenbean works freelance, so hit me up if you’re in need of some artwork. But that is not what this blog is about. My daughter saw the piece, and said that she would like her mom to do one for her bedroom, but instead of that Bible verse, she wanted Romans 16:1, because that is the Bible verse that has her name in it. I thought that was pretty neat, but it got me to thinking that I wanted her to do one for me, but I didn’t know which Bible verse to have her letter. The more I thought about it, the more I had some nice ideas. As I understand this verse, it is an important reminder designed to help Israel know its heritage–that of a wandering Aramean. No matter how mighty and powerful you become, remember you were a wandering nomad, moving around from place to place with no particular home. In my family, this is an important passage because it is the first Bible verse I ever taught my daughters. You should have heard their little mouths try to say Aramean. The reason I taught them this was essentially the same reason as Ancient Israel–I am a Heinze-57 mutt with no pedigree, no particular claim to any special heritage. I am neither a prophet nor the son of a prophet. I’m just a Christ-follower wandering through life trying to do the best he can. What I want to do with this canvas, if Kim will go for it, is to do the opposite of the wonderful “Footprints in the Sand” picture where there is a nice neat trail of footprints. Instead, we’ll show a desert (no beach) and the footprints will be going in every single direction, all over the place. Yeah, just like life. 2. Revelation 21:8 “Liars go to hell,” or something like that. When my kids were very little I taught them a cheap translation of this verse in the form of a song. I’ve embedded a Youtube video above of two girls singing the song. I do not know the girls, but them giggling while they sing it brings back memories of me teaching it to my children, and you should teach it to yours too! The backdrop for this is obvious–fire! This passage is from the life of King David. I’ve always loved it, because, don’t we all know how the beleaguered King of Gath must have felt, right? Just what I need, another crazy running around. Great, just great! Mrs. Greenbean could put different kinds of scene of crazy people in the back–someone talking to himself, a woman with matted hair pushing a shopping cart, and of course the obligatory man in a house coat. I’m curious, what verse would you like? Now, don’t go all spiritual on me. I’m being funny here. Don’t scold me and say John 3:16 or Deuteronomy 6:4 or something like that. Okay. Good.